The Texas baby blood war played out in Austin and in the national media last week. The abortion industry marshaled its legislative enablers (also known as members of the Democratic Party) at the state capital. The abortionists’ ire was directed at a proposed law that would impose a ban on abortion after 20 weeks of pregnancy unless a woman’s life is in danger, a requirement that abortions be performed at an ambulatory surgical center, a mandate that physicians administer medication abortion drugs in person and a requirement that physicians who perform abortions have admitting privileges at a hospital within 30 miles. To anyone but the abortionists and the extremist supporters of unlimited abortion these requirements are reasonable for any surgical procedure, including abortion, as well as for the administration of powerful drugs inducing abortion. The bill was introduced in a special session of the Texas Legislature because time ran out in the regular session. It passed the house, but with some differences from the senate bill, requiring the senate to debate and vote on the bill after the house passed it. 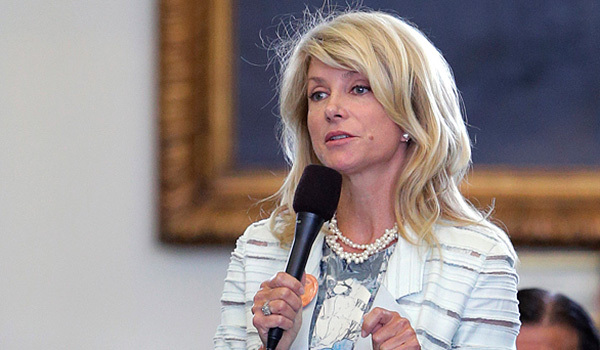 The Texas senate has a pro life majority, but the pro abortion forces, led by Senator Wendy Davis of Tarrant County, argued and filibustered, and stalled and delayed a vote on the bill as the special session was coming to an end. The abortion industry also rallied pro abort students from the University of Texas and individuals from Austin and other parts of the state, who invaded the capital building and crowded into the visitor’s gallery in the senate chamber intent on causing as much chaos as possible to force the legislative process to grind to a halt. To put it politely: It was a mob seeking mob rule. When Davis’ filibuster ran into procedural trouble because of her violations of the filibuster rule, the pro abort mob in the gallery yelled and stomped their feet, making it impossible for orderly business to take place on the senate floor. The Democratic senators on the floor went into anarchy mode, raising issues and playing to the mob. The chaos that ensued was worthy of the worst of what used to be called banana republics, although not entirely without precedent in the annals of Democratic Party political shenanigans in the Texas statehouse. But it worked. The bill could not be passed in the chaos, and before the special legislative session ended. Governor Rick Perry immediately called a second special session, and it is likely that the bill will be passed in the second session in spite of Senator Davis and her fellow pro aborts. Wendy Davis’ heavy legislative water carrying for the abortion industry has confirmed her as a stalwart of the industry, and made her a star in the Democratic Party and in the always liberal media. The left of center writers at the local newspaper in Tarrant County, the Ft. Worth Star-Telegram, have been unable to pass a single day since the filibuster without multiple professions of their undying support for the senator, even her pink sneakers. Ditto local TV stations. She is touted as courageous. As a champion. Hm. Sounds OK until you think about to what she has applied her alleged courage, and for what she is a supposed champion. Her courage is the courage to kill the defenseless and innocent unborn at any time while they are in the womb, even those who are in their 5th month of life or older. If you will, a bully on steroids. If you have ever seen a photograph of a child in the 5th month in the womb or later you will have an idea of what her “courage” means: A little body ripped apart and sliced up. It means innocent blood and homicide. If Wendy Davis is a champion she is a champion of the death of innocent human life, a champion of the killing of little pre-born human babies who will not become little post-born babies if she has her ugly way. In truth, she is a champion of the abortion industry and the blood trade of abortion. Certainly she’s not the champion of human life and human dignity, for which we always need true champions. Now some history (and scandal). Wendy Davis was a former member of the Ft. Worth, Texas city council when she decided to run for the Texas state senate in Tarrant County. The incumbent, Ken Brimer, was pro life and had been a generally effective senator for his district. Enter Ralph McCloud, a friend of Davis and who at the time of Davis’ campaign was employed by the United States Conference of Catholic Bishops in its Catholic Campaign for Human Development. He is still employed by the bishops, and today is the well paid director of CCHD. While continuing his employment by the Catholic bishops of the United States, including obviously by the Catholic bishops of Texas, McCloud offered his name and services to help the aggressively pro abort Wendy Davis in her senate campaign to unseat the pro life incumbent. During the campaign McCloud served as her campaign treasurer, publicly endorsed her, and did what he could to assist her campaign. He did all of this even though he was fully aware of her support of an unlimited right to abortion. As it turned out, her senate race was a close one and but for McCloud’s support Wendy Davis might not have been elected. But she was elected, and since taking office she has consistently fought every attempt in the Texas Legislature to reduce and control the killing of the unborn in Texas, including the senate bill she just helped to defeat. To this day she remains grateful to McCloud for his political support and encouragement. One must ask how it is possible that McCloud deserves any position in the USCCB, least of all a position as director of the Catholic Campaign for Human Development where he is supposed to be a leader in social justice. The mission statement of the Catholic Campaign for Human Development is this: “The Catholic Campaign for Human Development is an instrument of the Catholic Church working to carry out the mission of Jesus Christ, ‘… to bring good news to the poor … release to captives … sight to the blind, and let the oppressed go free.’ (Luke 4:18)” It may be a newsflash at the CCHD, but killing the innocent unborn is not part of the mission of Jesus Christ! It is important to stress again that McCloud’s very public and effective support of the abortion supporting Wendy Davis occurred while he was an employee on the payroll of the Catholic bishops in a job that required him to promote justice and dignity for all human life! Put another way, while his fellow Catholics were praying and working and giving their hard earned money to their bishops to promote justice, including wiping out abortion, Ralph McCloud was out and about supporting an abortion mongering politician. And it is not that the Catholic bishops did not or do not know about McCloud’s public support of Davis. They did at the time and they do now, but do not seem to care. As my late mother would say: Doesn’t that beat all you’ve ever heard?